The new Ruby mobile shower system has been designed to shower patients who cannot access the bathroom independently or with assistance. Whether incapacitated due to a critical condition, long term illness, or obesity, the Ruby provides unique and uncompromising hygiene levels within the safety and comfort of the patients’ own bed. A lightweight and waterproof sheet is positioned underneath the patient, which then fastens to the bed’s side rails, head, and foot boards. The waterproof sheet accommodates the patient, whilst ensuring full water containment from the shower hose, and can be laundered at 70ºc for re-use. Alternatively, a low cost replacement sheet can be used as a patient specific item, or simply disposed of. There is an integrated water vacuum which transfers waste water from the sheet into a dedicated waste water tank on the appliance, which can be drained after use. The Ruby is compact and highly manoeuvrable and is supplied with a purpose designed, double-width drying towel and waterproof shower sheet. All components are fully integrated into the appliance making it safe and user friendly. 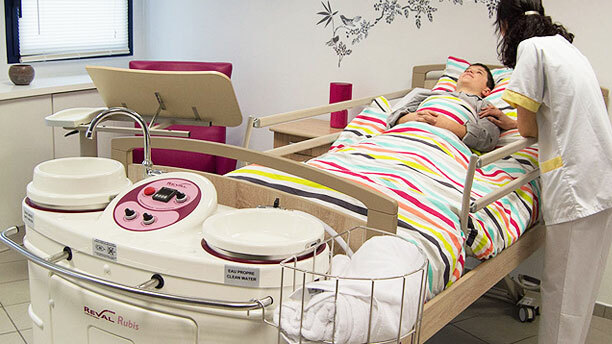 The Ruby incorporates anti-scold protection by thermostatically controlled water, which can be pre-set and heated to suit the patient’s specific needs. The control panel has a simple interface, whilst the shower hose has a trigger, making the water pressure easy to control and comfortable for the patient or care worker. The Ruby holds up to 23 Litres, which is sufficient to shower a patient. All surfaces of the Ruby are smooth, making it easy to clean and disinfect, using its built-in hand operated disinfection applicator, located discretely at the front of the appliance. 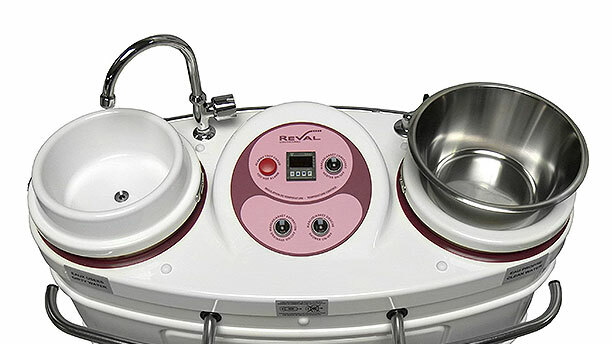 Reval produces its own disinfection cleaning chemical for use when cleaning the Ruby. All hoses are easy to remove and can be thermally sterilised and replaced in minimal time. To be used with the Ruby in bed shower system to promote bed side shampooing and hair care with ease. With the patient in mind there are no limits when attending to personal care and hygiene needs for individuals who are limited to the bed. 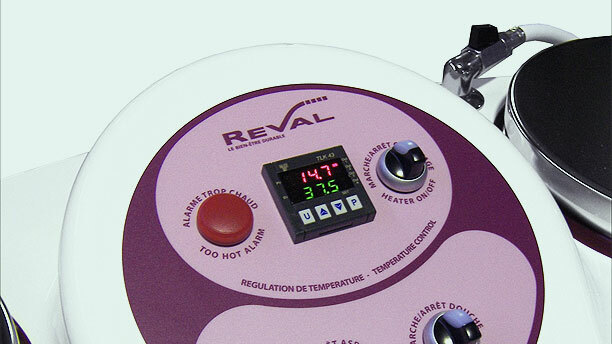 Reval promote patient well-being and independence by providing solutions that attend to every need. Offers safe and effective single step Cleaning and Disinfection for all equipment and surfaces in any Healthcare setting. Highly effective against bacteria viruses and fungi, its Chlorine free, Fragrance free and Alcohol-free formulation ensures it is non-toxic, non-irritant and non-corrosive. Tried and tested on all our appliances the solution offers prolonged antimicrobial effect after application. Additional Ruby bed protection sheets can be supplied when required. To be used with the Ruby in bed shower system for focused foot care and hygiene of ankles and heels. Additional Ruby White bath towels can be supplied when more quantities are required. This purpose designed, double-width drying towel can be measured in at 158x200cm. The coverage of this towel allows the patient to be dried and cared for more effectively with the minimum patient manoeuvre. The Ruby stainless-steel basket is designed to further improve and simplifying the showering procedure for the care giver. The stainless-steel basket securely fastens on to the two stainless steel hand rails creating a compartment to organise and store the showering equipment required. Towels and sheets can be placed in here after use for ease of transportation to being laundered. ©2018 Reval Continuing Care Ltd. All rights reserved. Website designed and developed by Huw David Design.